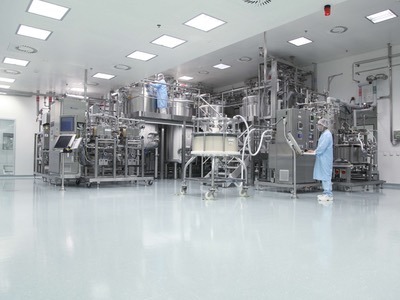 Cleanrooms are highly controlled environments, but equipment and personnel can introduce contamination to these aseptic manufacturing areas. 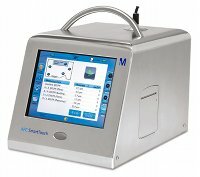 It is therefore extremely important to use the best tools to identify any microbial activity. 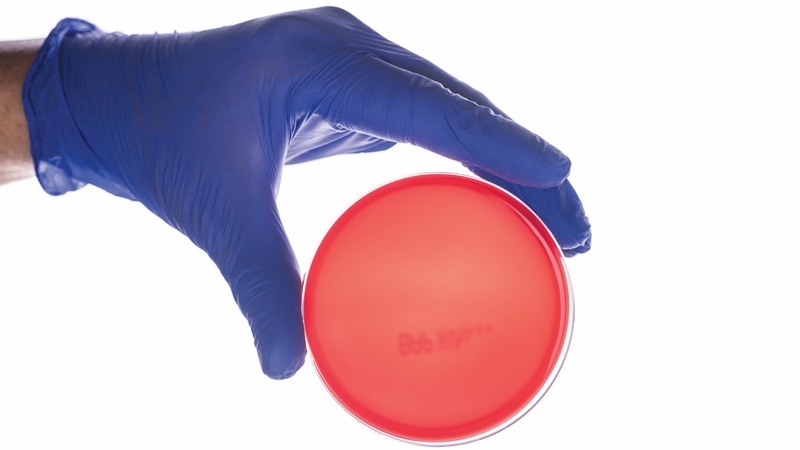 The most commonly used media for this purpose is tryptic soy agar (TSA), a non-selective medium known for its ability to allow a broad variety of organisms to grow. 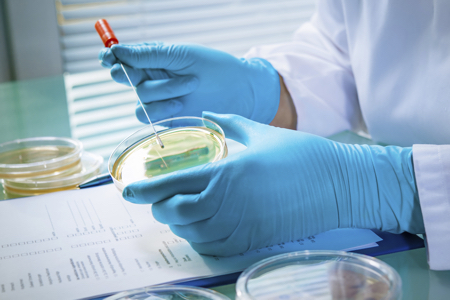 The TSA is supplemented with neutralisers to counteract any antimicrobial agents used in the cleanroom. 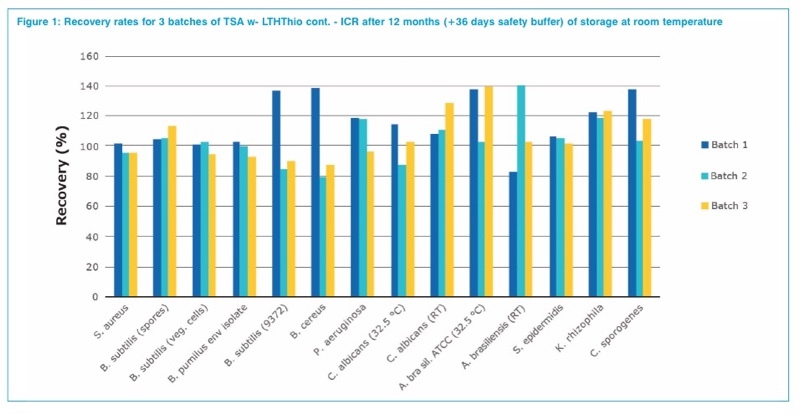 This case study was carried out to verify that TSA ICRplus contact plates with LTHThio promote the growth of the most common contaminating bacteria, even in the presence of disinfectants. The new lockable contact plates filled with TSA and a neutraliser mixture composed of lecithin, polysorbate 80, histidine and sodium thiosulfate (TSA w. LTHThio cont. – ICR+, reference 146783) are triple-bagged and gamma irradiated for use in grade A cleanrooms or isolators. 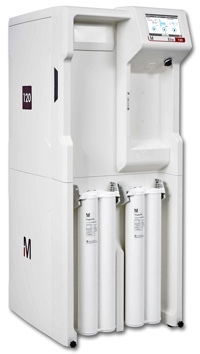 Due to their specific locking system they can be used for aerobic and anaerobic surface and personnel monitoring. 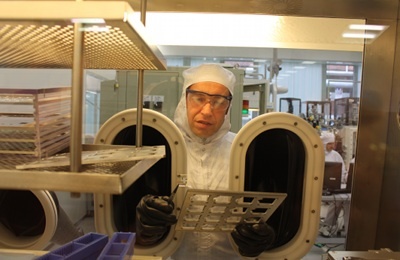 Triple packaging and gamma-irradiation allows a safe transfer of the plates into cleanrooms and isolators by removing one packaging layer per material lock. For use in isolators the packaging material has been proven to be impermeable to vaporised hydrogen peroxide for a safe decontamination of the bagged plates in the isolator. The features of the plates should follow the ISO 14698 requirements listed above and have a neutralisation efficiency towards a range of disinfectants that covers the most widely used active agents. The pharmacopoeia recommend a recovery rate of 50%–200% for growth promotions tests compared to the reference batch.1,7 For validation purposes the lower acceptance limit was increased to 70%. The results are shown in figure 1. Furthermore, the growth promotion tests were also performed for plates, which have been stored for 12 months according to specifications including an interim temperature shift of either three days at 4 °C or three days at 40 °C to simulate temperature peaks during transportation. All test strains show good recovery rates. As contact plates are mainly used to evaluate the contamination on sanitised surfaces a neutralisation of a wide range of biocides is required. The concentration of residues of disinfectants on dry surfaces is very low. For non-oxidising active agents, such as quaternary ammonium compounds, bis-biguanides, phenolics and aldehydes an amount of 25 μl per contact plate is expected to be comparable to a surface, which is fully saturated with the disinfectant and dried. In the case of oxidative active agents, especially for oxidative agents such as hydrogen peroxide and chlorine based disinfectants, the remaining residues are much lower than 25 μl of disinfectant per plate. For the validation of the neutralisation efficiency three batches of the culture medium TSA w. LTHThio cont. ICR+ (reference 146783) were used and the growth promoting properties for several microorganisms were tested in the presence of the disinfectants listed in table 1 and compared to the recovery rate on non-treated plates from the same batch. The recovery rates for all selected microorganisms was always > 70% in the presence of 25 μl of the tested disinfectants. The results are listed in table 1. An additional feature of TSA w- LTHThio cont. – ICR+ is the long shelf life of 12 months, which allows the reduction of incoming goods inspections for the user. The validation results of the growth promoting properties of the medium show very good recovery rates for the selected test organisms, which might be present in a cleanroom. This could also be confirmed even after temperature peaks, which might occur during transportation. Also, the second important feature of an efficient neutralisation activity is confirmed for the tested active ingredients, such as alcohols, aldehydes, hypochlorite, quaternary ammonium compounds, hydrogen peroxide, peracetic acid, organic peroxides as well phenolics for the working concentrations. The Certificate of Analyses was also realigned and contains additional features to support customers documentation: bar code test result, results of a disinfectant neutraliser test (and the growth promotion test result of an anaerobic strain).